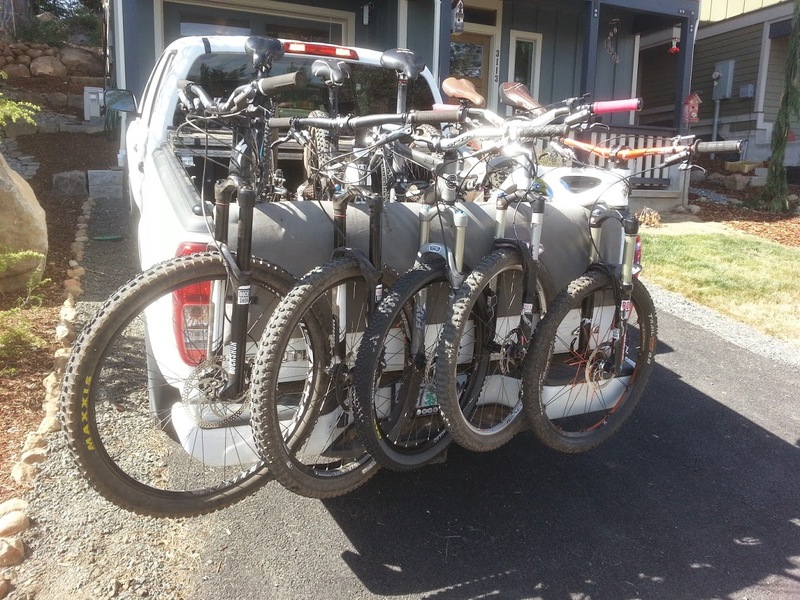 The pickup truck with tailgate pad, meeting the gold standard of shuttle vehicles – 5 people, 5 bikes. Must be able to securely carry a minimum of 5 bikes. Biking with friends is always more fun. Must maintain access to the back (trunk) of the vehicle. Crawling over the back seat is not always more fun. Must hold the bikes by the wheels only. I am tired of racks that rub the paint off the frame. When I had a pickup truck, this was easy. Just get a tailgate pad and you’re good to go. But once the pickup truck was replaced by a van, things got a little trickier. And even with the pickup truck, with five bikes in the back there was little room for much else (maybe it would have been better if I had a full size pickup). I puzzled on this for several years, trying various things that I wasn’t super happy with, but ultimately came to a setup that is awesome! Swingarm: The RakAttach allows easy access to the back of my van by allowing the rack to swing out of the way. At first I was concerned this was going to be hard to do, given the quick pin and the latch you have to undo, but you get used to it really quickly and now it only takes a second to swing out. the swingarm that RakAttach makes is extremely strong, I’ve looked at a couple other suppliers of these and really no one else is making something this robust. I have zero concern about the rack performing with five all mountain bikes hanging from it. The RakAttach swingarm is really smartly put together including the extremely stout pivot, latching system and quick pin. The pin is great for dropping in and aligning the swingarm before latching. It allows you to get the swingarm in the ideal position to make this process easy. The pin also locks the swingarm in the swung outward position, to keep it from attacking you, should you be parked at a funny angle. The RakAttach also has this great elastomer type wear material fastened to the bottom (fixed) portion of the swingarm. This makes it so that when the pivot is latched there is a a flat surface along nearly the entire length of the pivoting arm for it to rest on. I’m sure without this there would be a lot more play in the system. As it is, there is virtually none. Using a wearing surface for this is brilliant, so you don’t have metal to metal contact. Like I said, the swingarm is very well put together. 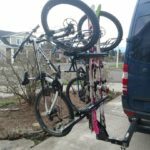 Bike rack: After debating for a long time about building my own hitch rack, I am so glad I finally decided to purchase the Recon Rack. Its really just so much better than anything I could have put together on my own. There are a bunch of competing bike racks in this style, such as the North Shore rack and Lolo Racks – and these are great options. But I think the Recon Rack is better. For one thing, it’s the only rack of its kind that meets criteria #3, only holding the bike by its wheels. This may not be a big deal to some, but it annoyed me to have the paint rubbed off on my bikes top or bottom tube without a good riding/crash story to justify it. Also, the Recon Rack is super stout, definitely overbuilt, but also confidence inspiring. Finally, the Recon Rack is extremely easy to use, once you get the hang of lifting the bike and tilting the handlebar to fit the wheel basket (which I admit does take some getting used to) it’s a breeze to load and unload bikes. The Recon Rack shipped to me (from Bellingham, Washington, so not far) in just a few days in a big heavy box, but assembly was very straightforward. Everything on the Recon Rack is top notch. The welds are perfect, the rack powder coating is excellent, and the whole rack put together looks really cool. The rack setup with the rack attach sticks out farther from my vehicle than I would like. Unfortunately, I just couldn’t get the holes to line up in the position that would be closest to the vehicle. The van is big enough as it is, so having things stick out farther than needed on the back is a bit of a drag. The Recon’s wheel baskets wont hold anything larger than a 3.0 tire. This works for all my current bikes, but might be problematic in the future. Because of how the bike sits in the rack, the front wheels tend to get rubbed wrong in the trays – especially over long distances. This can lead to damage to front tires. Its really expensive, but like I said when I introduced this topic; you get what you pay for. 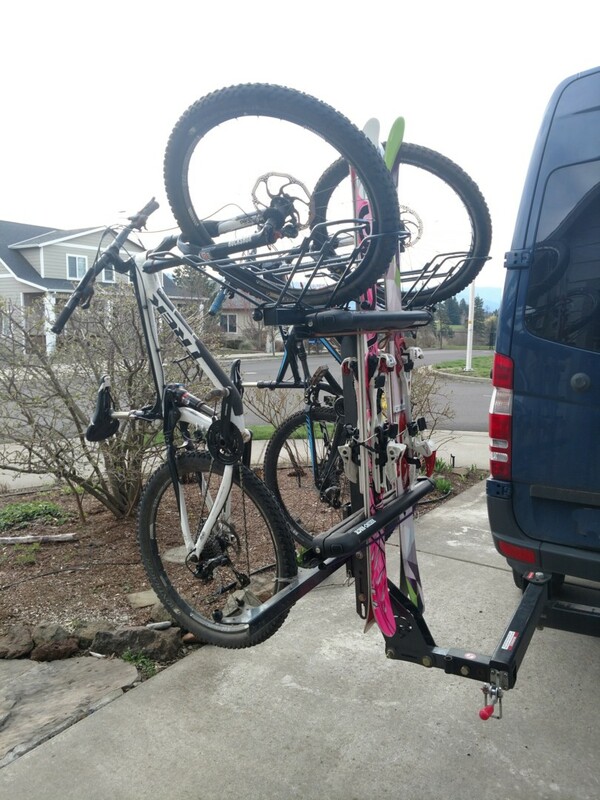 Overall I am extremely satisfied with my ultimate bike rack setup. When I am using it, I don’t think about the expense or the alternatives, I just think about the trails ahead. Full disclosure: I have received no money, credits, discounts or anything else from the makers of these rack systems. I am just a fan that wanted to share my experience. Update 4/2/2017: I was told I needed to add more pictures of the pivot and how everything works. 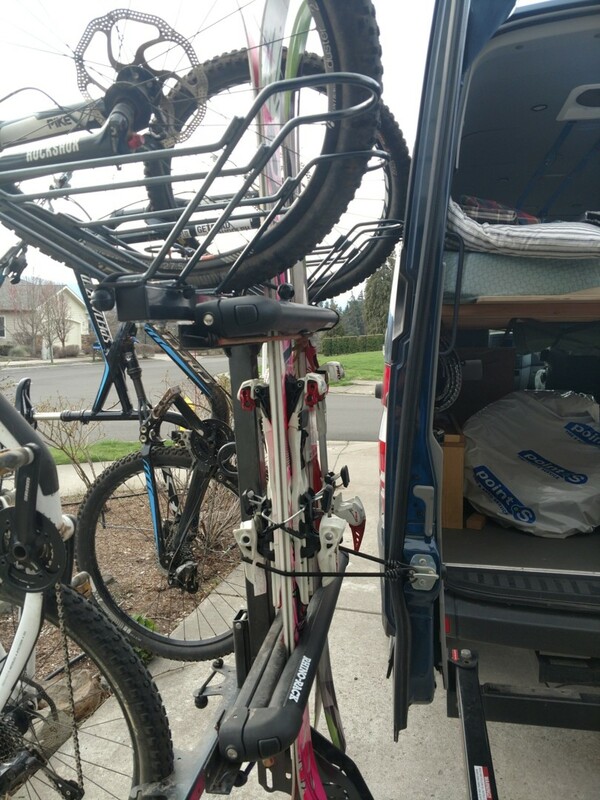 Recently, I converted my custom ski rack add-on to ‘hybrid mode’ to carry both bikes and skis. Given it was a good time to take more pictures, below are a few of the rack in various positions. 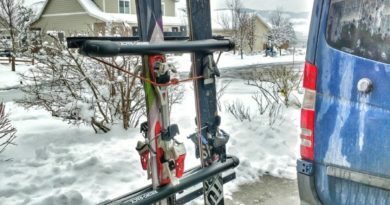 Note, the rack doesn’t usually come with ski carriers – that was an aftermarket customization we made and also note one of the middle wheel trays has been removed to accommodate the skis. 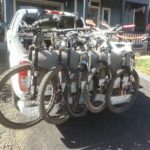 We should be able to carry three pairs of skis and three bikes on the back with this setup, which will be handy when we head to Alaska later this spring. Tire damage from the rack. This tire had been used approximately twice before this trip. The rack basically rubbed all the way through the sidewall. Update 8/7/2017: Some folks have told me that the Recon Rack can damage the front bike tires hanging in the tray on long road trips. 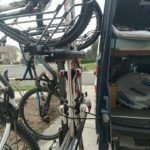 Several trips all over the western US and Canada (probably 10,000 miles with bikes loaded in the rack) did not really reveal this problem. However, during a recent mountain bike adventure in Eastern Oregon I learned two very important lessons. 1) Tire damage can and does occur on very (read: 4×4, low range) bumpy roads. 2) Apparently, with just the right circumstances (very bumpy roads), bikes can come out of the rack, be drug behind the vehicle, and essentially be destroyed in just a few hundred yards. Consider yourself warned and take the appropriate precautions if shuttling this type of terrain. I have seen a few methods for decreasing the friction in the wheel trays (PVC pipe, rubber tubing, etc.) to prevent tire damage – which I will check out and report back on. For keeping bikes from falling out, consider using auxiliary straps to hold the bikes in the trays. Based on our experience this doesn’t appear to be necessary for “normal” driving (even miles and miles of washboard gravel roads traveled at high speed didn’t seem to cause issue), but is now recommended for “more extreme” road conditions. 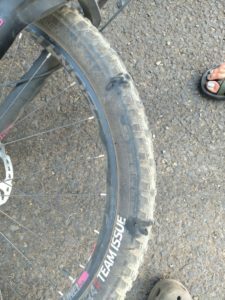 If the bike tire is getting damaged like this on rough terrain, consider what a rack like North Shore would do to the frame (especially a carbon frame) if subjected to the same stresses. I’d much rather damage a tire (replacement cost $50) than a carbon frame (replacement cost: $$$$$). 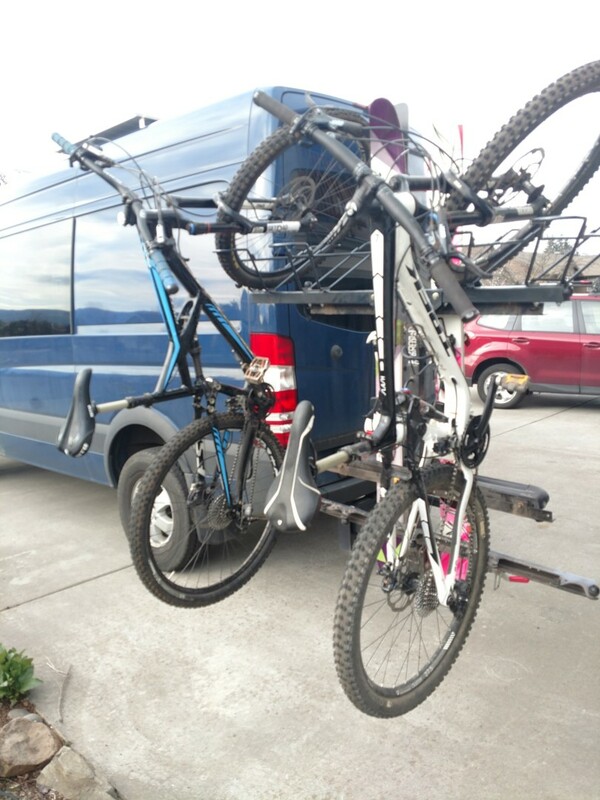 The Recon Rack holds bikes in better than any other vertical rack I have seen (this is the first time I have ever heard of a bike falling out of the Recon – I have heard several reports of bikes falling out of other vertical racks). Be it user error, road conditions, or otherwise – this is a risk you take hanging your bike off the back of a vehicle. 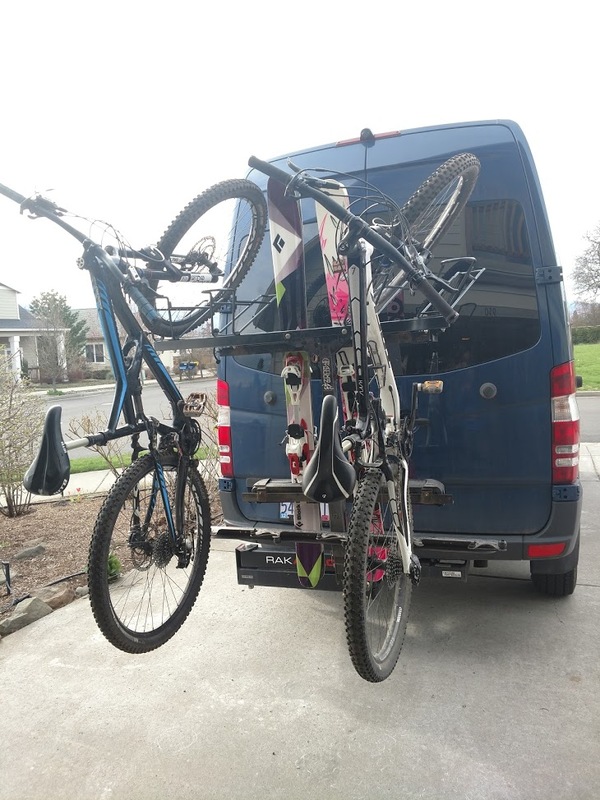 Horizontal wheel tray style bike racks (like the Yakima or Thule offerings) that support the bikes horizontally stick out much further and have much lower departure angle ground clearance than vertical racks. Though I believe these hold bikes better, they limit your driving access to terrain (and also make parking harder). 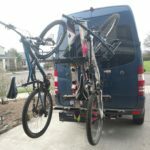 If you are only carrying two bikes, this might be a good option – but I maintain my recommendation for the Recon for 4+ bike capacity. 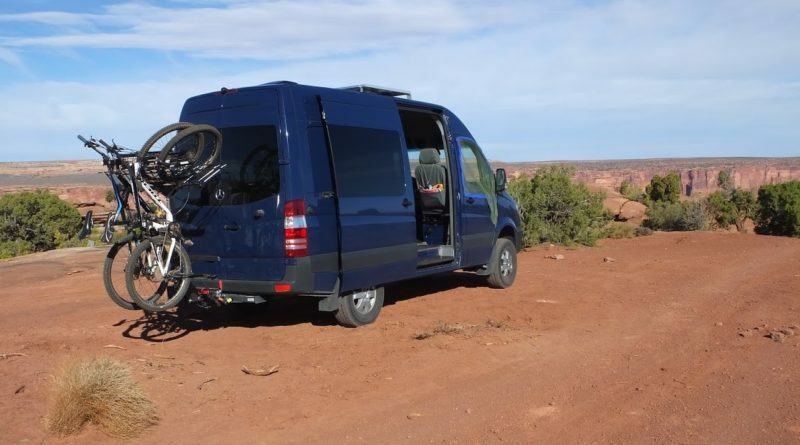 I have this exact setup on my 2004 Sprinter campervan… RackAttach Large (driver side swing) and Recon Gen2 R5 rack (with pivot). 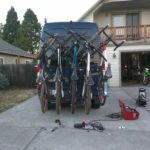 While originally stoked about the setup, I have noticed a considerable amount of vertical play in the combo when loaded with five bikes. 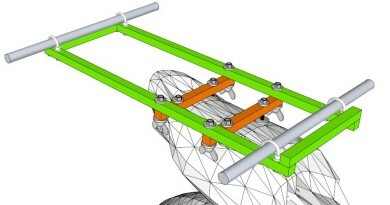 The rack is rock-solid, however the RackAttach has far too much play in the joints. When I spoke to 1Up (who bought RackAttach) they told me this product was never meant to support something like the Recon Rack R5 rack, and that I was very lucky to have not snapped their swingarm. When I spoke with Cody at Recon, he said the exact same thing, thus I have removed the RackAttach, and am looking for another option. Alas, nothing is on the market at the moment, however Cody did let me know that he is working on something, but it is not on the market just yet… I have some pics of my setup loaded with bikes, but can’t figure out how to attach to this comment. Happy to email them if anyone is interested. Cheers! In the nearly three years of owning the RakAttach and Recon R5 I have not experienced a significant amount of “vertical play.” Every once in a while I tighten up all the bolts (on the main hitch, the RakAttach Hitch, and the swingarm latch). We’ve done quite a few long trips and some very rough roads and haven’t had much issue with things becoming loose – its just a precaution. I am curious where the ‘vertical play’ is coming from? Is it in the swingarm pivot/bearing? or ?? When I bought my Recon from Cody in mid 2016 he indicated that his own version of a swingarm was forthcoming. Guess R&D takes quite a bit of time if that’s still the status. As for what the RakAttach is made for – I guess 1UP is just being careful. When the RakAttach was first being marketing the owner said it could hold a motorcycle tray. Thats a lot more weight than a half dozen bikes. 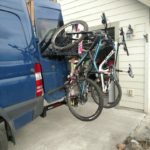 I’ve seen a few others with similar setup and quite a few more folks with the North Shore rack and a RakAttach – not sure if they are all having problems and I am just lucky. Looks like 1-up still advertises a weight limit at 275 lbs – which would cover 5 35-40 pound bikes and an 80 pound Recon R5 (just barely). Seems like if the bearings are going in the pivot that’s something that can be fixed (or warranty’d if it’s not that old). 1-UP’s claim that its outside their design parameters seems a bit fishy – given what they advertise. Anyway, all good information. Thanks so much for posting your experience! 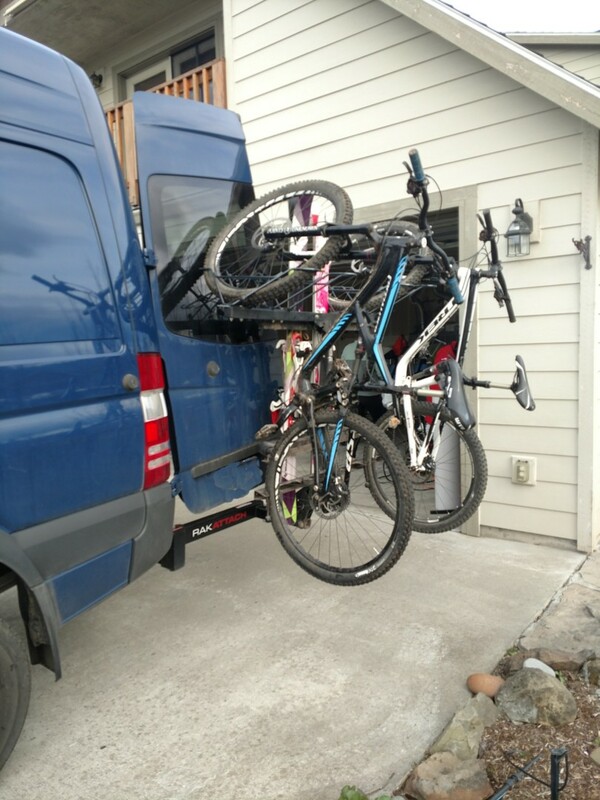 I already have a rack attach for our Sprinter. I use it with my Thule Apex 5 Rack. The rack is bouncing a lot with the rack attach. I do not like the setup. too much bouncing and bicycle rubbing. I think I’ll go with the Recon. On new Gen 2 Recon, I think the pivot will do the trick to open the door. You can tilt the rack with the bikes on. I think it gives enough clearance to open the Sprinter doors. I really like the rack attach but if I could open the door easily with a tilted rack I could be also great! Let me know how the Gen 2 works. I was worried the pivot wouldn’t clear the doors unless it was mounted way back from the rear doors. I personally don’t notice any additional bouncing from the rack attach, but I have it pretty well locked down with the U-bolt hold down system on the 2″trailer insert that it came with. I shook it around quite a bit to confirm just now. The RA barely moves. Most of the play is in the Recon Rack mast, but that’s pretty minimal too. Curious why your setup shakes so much. Might be a warranty issue with RakAttach? Just for the record, NorthShore Racks do not contact the bike frame in any way. The bikes are suspended by the fork crowns which will receive some minor abrasions from the friction, and they are also lashed at the rear wheel where a cord will contact the rim. There are no limitations to tire size with the NorthShore Racks. Frame or fork- either way, that type of contact where hard points will be abraised is just unacceptable. I have a RakAttach on the back of my van and love it. I am interested in carrying 5-6 bikes vertically on the back but when I mentioned that to Cody he thought that his rack would put too much stress on the hinge of the swing arm. How has yours held up? Do you have the Heavy Duty Rack Attach that works with Dirt bikes (has two contact points with hitch) or just the standard one? Thanks for the great write up and photos. I am not sure which Rak Attach I have. I have the “Large” one. It connects to the 2″ receiver on the van – just that one place. I can’t seem to find any alternatives on the Rak Attach website. It seems fairly heavy duty. I have not had any problems carrying 5 bikes with the Rak Attach. It appears to be just as solid as when it is carrying nothing. Swings out perfectly. Really, no complaints about the Rak Attach at all so far — and its seen some fairly big trips over the last year. It continues to swing out just fine. I know Cody is working on his own version, so perhaps that’s why he is downplaying the Rak Attach. I’m pretty happy with the Recon – but it does have its downsides – as noted above. Is the top (swinging arm) and bottom (fixed arm) both 3″x3″ square tubing? What thickness? The rest I think I can get just from looking at pictures and designing my own. Thanks again for all your articles! Did you ever consider 1UP racks? I hear they have a lot of good reviews too. Just how far out exactly do the bikes stick out from the back of the van? 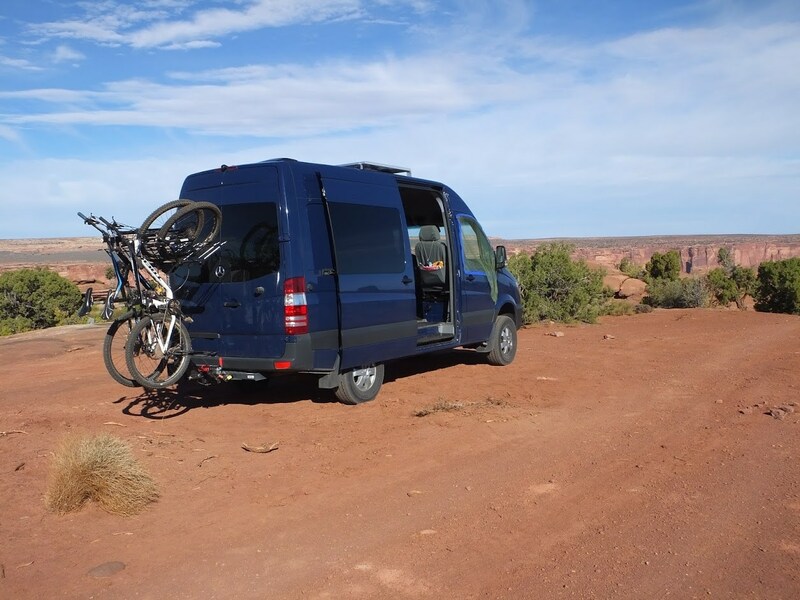 Overall the bikes probably stick out about 4′ from the back of our van. It is significant, so much so that when we have bikes on the back we usually have to find an RV parking spot or take up two, to avoid sticking out. I don’t know the details of the Recon Rack fabrication. I’d think most of the main posts are 2″ x 2″ to match the standard hitch size. But other than that, no idea. I toyed with the idea of making my own rack for quite some time – but in the end, buying something was easier. Recently, Lolo racks went back into production. They are a more cost effective option that I have heard good things about from others. Just make sure you secure the bikes well from bouncing out of the handlebar hangers. Alternatively, you might consider to just buying the handlebar hangers from Lolo, for your custom fab build. That too might be a very cost effective way to go – without the complex metal fabrication to make your own. 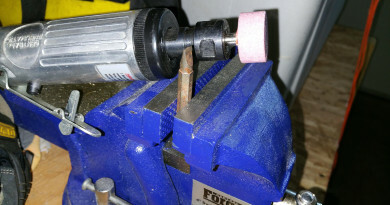 (don’t know your welding/fab experience level to know what’s doable for you – when I was thinking about it for me, the complex steel shapes for any kind of bike holder were intimidating). I looked at the 1-up. but decided against that option for various reasons – mainly not being able to carry 5 bikes with it. Oh. One quick additional note though, the driver side rear door is not able to open all the way with the swingarm swung open. It opens 99% of the way, but hits the tires or bike trays before it gets all the way to the internal ‘door stop’. This can be annoying if parked at an angle or if its windy. 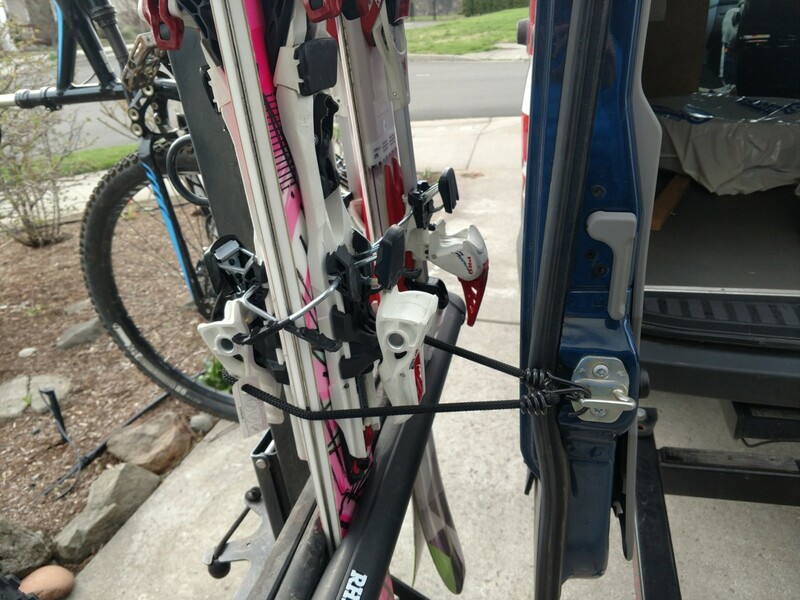 What I do is keep a bungee chord in the door pocket and when I want to hold that door open I just attach the bungee to the door latch and wrap it around the rack (in the locked out swingarm position). This holds everything open and itsn’t too much of a process. Thanks for the additional info Austin! Much appreciated. Glad to hear it’s working for you because I just pulled the trigger on the recon. Appreciate the bungee tip as well. Thanks again. Now that a bit of time has passed, how is this setup working for you? 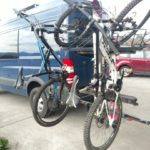 I have a rak attach on a sprinter and I’m thinking of getting a recon rack to go on it. Right now I have a 1up rack, which is great, but only carries 2 bikes. Has it been an issue with the bikes sticking out too far as you noted? Do you have any pictures with the swing arm extended? Did you get the recon with or without the pivot? If you got the pivot, do you ever use it? Any other problems? Thanks! (You are the only one I’ve found with this exact setup so any additional info would be great). Yes! Still super stoked with this setup. I really don’t notice the bikes sticking out so far unless I am trying to parallel park – which is a challenge in the van anyway. The recon rack is just so easy to use, loading bikes on and off I am very glad I went with this particular vertical bike carrier. And the swingarm is so easy to actuate it makes it simple to get in and out of the back of the van. No more squeezing behind the bikes to try and get stuff. 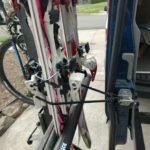 Unfortunately I do not have any other pictures of the rack – I hope to update this post with better photos next spring, but right now the rack is in ski mode. We did not get the pivot. I don’t have it, so I haven’t used it, but there hasn’t been a single time where I have ‘missed it’ either.